A state of the art combine harvester is taking to the streets of central London for one of the UK’s most historic parades. John Deere has teamed up with The Worshipful Company of Farmers and the NFU for this year’s Lord Mayor’s Show (Saturday November 8) in a campaign to encourage the public to back British farming. 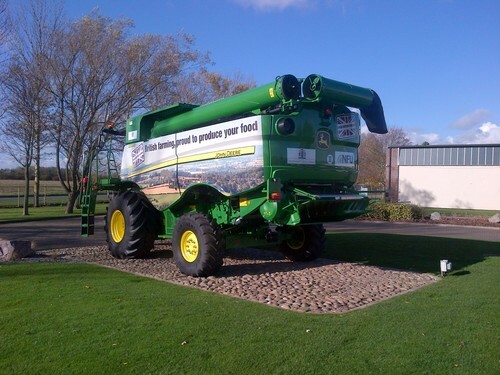 A John Deere S685i combine, specially decorated with vinyl graphics depicting the great British countryside, is being used to demonstrate how our food is produced. The John Deere combine will be driven from Mansion House to St Paul’s Cathedral and on to the Strand before a return leg along the Embankment and Queen Victoria Street and back to Mansion House. The combine’s 6m (20ft) 620R header will be towed by a 1946 John Deere Model D tractor. Eight young farmers representing the NFU’s seven English regions and Wales will accompany the combine to promote farming and agriculture as a modern and vibrant industry that provides a wide range of career opportunities such as agronomists, scientists, vets and engineers. This year is the 687th Lord Mayor’s Show and is expected to attract crowds of more than half a million people on the day, lining the pavements on the three mile long procession through the City of London, as well as millions more watching the live broadcast on BBC 1. The S Series combine harvester S685i is one of a range of rotary combines, with three other models available from John Deere in the UK and Ireland. This combine can cut up to 150 acres of crops a day, harvesting up to 750 tonnes of grain; that is about the size of 79 football pitches. A combine can harvest a wide range of crops including barley for beer and wheat for bread and biscuits, as well as peas and beans. The UK currently produces on average 15 million tonnes of wheat each year, nearly 7 million tonnes of barley and 600,000 tonnes of oats. 5 million tonnes of wheat are milled each year which produces 4 million tonnes of flour. Each tonne of wheat will make 1533 loaves of bread, which means one combine can harvest enough wheat in one day to make 1.2 million loaves. 85% of the wheat used by UK millers is grown in the UK. Nearly 12 million loaves of bread are sold in the UK every day. Each tonne of malting barley can make up to 10,000 pints of beer, so in one day one combine can cut enough barley to make 6 million pints of beer. The UK cereal industry contributes £1.55bn to the UK’s GDP each year.